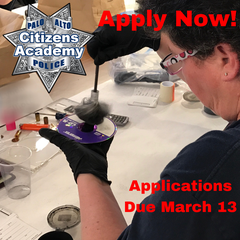 The Palo Alto Police Department is now accepting applications for its next Basic Citizens Police Academy, which runs from April to May 2019. The Basic Citizens Police Academy is an 8-week course designed to foster increased understanding and communication between community members and the police. Instructors are public safety employees who present on topics such as patrol procedures, laws of arrest, search and seizure, community relations, criminal investigations, evidence collection, police accountability, use of force and officer safety, disaster preparedness, and more. Students are also able to go on a ride-along with a patrol officer, participate in a “sit-along” with our public safety dispatchers, and experience a force options video simulator. The Citizens Police Academy offers participants detailed insight into how our Department operates and how we serve the community. It creates well-informed community members who possess greater knowledge of police practices and services. Everyone benefits from increased communication and mutual understanding, including our officers. The Citizens Police Academy runs for eight consecutive Wednesday nights, from 6 p.m. to 9 p.m., at various City of Palo Alto facilities. The session begins on April 10 and ends on May 29. There is also a kick-off event that occurs on Monday, April 8, from 6 p.m. to 9 p.m. There is no cost for participation, but the class is limited to 25 students. Applications for this session are due no later than Wednesday, March 13. Applicants must be at least 14 years old, live or work in Palo Alto or the immediate surrounding community, be free of felony convictions, not have a misdemeanor conviction within the past year, and be able to successfully complete a criminal background check. After submitting the written application, applicants will have an interview with the Citizens Police Academy coordinator before the criminal background check is performed. Preference is given to Palo Alto residents and students, community members who work in Palo Alto, and people employed by the City of Palo Alto. The Palo Alto Police Department first offered its Citizens Police Academy in 1995, and over the course of the next 14 years, ran 24 classes that produced more than 350 graduates. Several of those graduates went on to become volunteers with the police department, and others even went on to become career police officers. The program was discontinued in 2009 due to staffing reductions within the Police Department, but made its return in the fall of 2016 with a completely redesigned curriculum. Since then, six classes have graduated. We now run three Basic Citizens Police Academy classes annually, with new classes beginning every January, April, and September. Application periods for each academy class are announced separately. Advanced Citizens Police Academy courses, where graduates of the Basic Citizens Police Academy will be able to attend free one-night sessions that focus on a particular area or specialty within law enforcement, are slated to return in the spring of 2019. Past Advanced Citizens Police Academy topics have included sexual assault investigations, identity theft protection, SWAT, and more. [link disabled, as the application period has closed]. Completed applications should be e-mailed to pd@cityofpaloalto.org, sent via U.S. Mail to the Palo Alto Police Department (attention to Citizens Police Academy), or dropped off at the front desk of the police station during normal business hours (Monday to Friday, 8 a.m. to 4 p.m.). Again, applications for this session are due no later than Wednesday, March 13, 2019. For questions or additional information, please send an e-mail message to pd@cityofpaloalto.org.